While some things are best kept a secret, that’s not the case here. Award winning, Hollywood legend Mark Wahlberg (“Ted” 2012) keeps us at the edge of our seats in the latest spellbinding crime drama, “Broken City,” directed by Allen Hughes (best known for co-direction with his twin brother Albert Hughes for films like “Book of Eli” 2010). Behold the phoniness, sleaziness, jealousy, pride and greed of NYC’s most powerful – the politicians and the police. In the first few seconds, we hear gunshots, followed by labored breathing and a camera pan upward to a stunned expression. Jump seven years later. After a near miss murder charge that forced him out of the police force, Billy Taggart (Wahlberg) takes his talents elsewhere and opens up his own private investigator agency. The neck and neck mayoral race has the city’s most powerful up in arms. Incumbent Mayor Nicolas Hostetler (Russell Crowe, “Les Miserables” 2012) will stop at nothing in order to triumph over his younger competition, Jack Valliant (Barry Pepper, “True Grit” 2010). One day, Billy is unexpectedly called into the Mayor’s office for what seems like an innocent meeting. Next thing we know, Mayor Hostetler is handing over a cash advance of $25,000 for Billy to track down the “phantom” that is supposedly sleeping with his wife, Cathleen (Catherine Zeta-Jones, “Playing for Keeps” 2012). Billy, who is strapped for cash, instantly accepts the offer and thinks he will snap his shots of proof and be on his way. From this point forward, almost everyone he comes into contact with is keeping secrets close to vest, both their own and others’. To say Billy is perpetually caught between a rock and a hard place would be an understatement. The audience is as much in the dark as Billy and everyone else in the film, which ups the ante even more. This adrenaline-pumping thriller delivers everything from suspense, espionage and violence to conspiracy, romance and even a high-speed chase. The solid cast is also accompanied by Kyle Chandler and Jeffrey Wright, although they do not have as much screen time as they should. Without giving too much away, I wish Billy’s relationship with his girlfriend, Natalie (Natalie Martinez), had been played out further. It also bothered me that Billy, a former alcoholic who, one night, gets hammered off of whiskey, suddenly turns sober when he gets an important phone call. Hughes amplified Billy’s drunkenness with a series of trippy shots and then the next scene is as if it’s a new day, not twenty minutes later. In another scene, Billy goes to visit Natalie’s parents – an unnecessary moment that adds no value to the story. These observations didn’t ruin the film, however. The dialogue is sharp and salty, especially between Cathleen and her husband. Audiences clapped and commented whenever they interacted on screen. 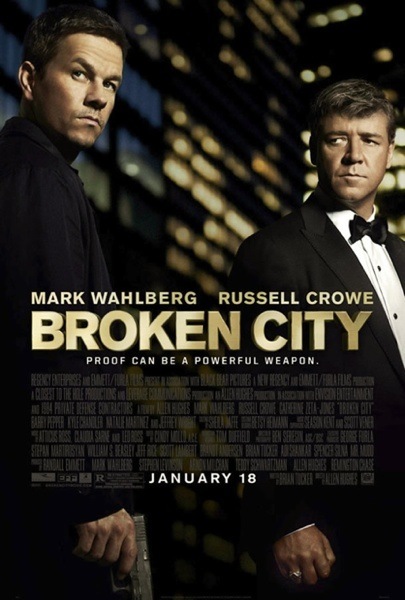 “Broken City” was shot on location in New York and later in New Orleans due to production logistics. Production designer, Tom Duffield, used the exterior shots of New York and nicely cohered the two locations. This is screenwriter Brian Tucker’s first produced feature and Hughes’s first film as a solo director. This team makes it work. Wahlberg shows many facets of Billy. His calm yet sometimes intimidating demeanor makes you curious about all of his secrets. He’s not into the limelight, which contrasts nearly everyone else in the film. Billy’s disposition is perfect for his job but you just never know when he may snap and you certainly don’t want to be in his path when it happens. Zeta-Jones’ character may not be a large role but we quickly discover it is a significant one. Her splendor and intellect are deceiving at first but once the tables turn, the snide remarks are enjoyably endless. An old time, preppy and spray-tanned Crowe shined his pearly whites throughout the entire movie and didn’t miss a beat when it came to the New York accent. His character is magnetic and repulsive all in the same breath. Bottom Line? “Broken City” is a suspenseful, gritty crime thriller laced with corruption and conspiracy and topped with a sharp, salty dialogue. With so much deceit, it may be difficult to follow at times but it certainly doesn’t stop us from wanting more.